This is a four-page student guide developed for use with the PhET "Wave on a String" simulation. 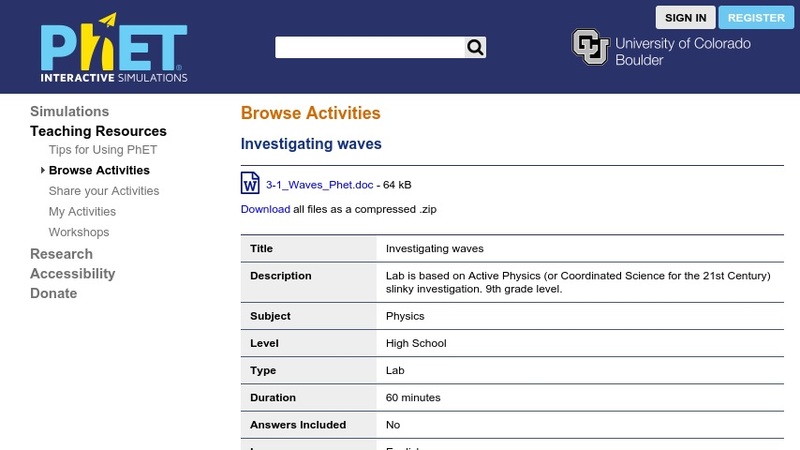 Written by a high school teacher, the activity provides a roadmap for secondary physical science students to learn about wave properties in an interactive environment. Students explore how amplitude, frequency, and wavelength affect the movement and speed of a wave. The wave simulation, which must be open and displayed to complete this activity, is available from PhET at: Wave on a String. This lesson is part of PhET (Physics Education Technology Project), a large collection of free interactive simulations for science education.